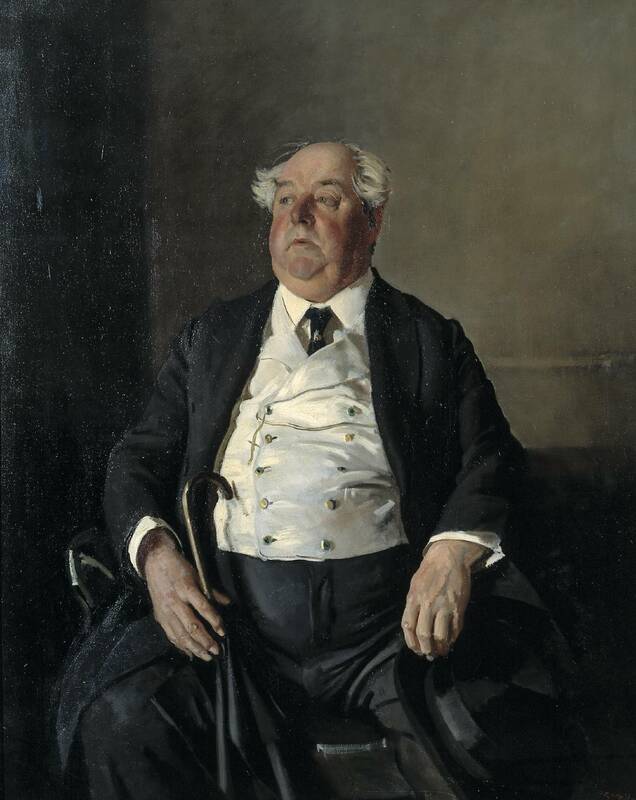 Mr Minney a painting in oils 50" x 40" by W W Russell ARA, purchased from the artist by Charles Moore and presented to the Tate in 1920. It was exhibited in 1920 at RA and acclaimed as the picture of the year. The portrait brought the artist into great prominence and led to much speculation concerning the sitter, who was an artists model and was said to have been formerly on the stage. The painting is produced in 'Tate Gallery Illustrations', 1928 and in James Laver's 'Portraits in Oil and Vinegar', 1925. "Recent gifts to the Tate Gallery made through the National Art Collections Fund include the portrait "Mr. Minney", by W.W. Russell, R.A., lately purchased by a member of the fund and presented through it to the nation, and also a water colour drawing, "Saintes," by Clarkson Stanfield, presented by Mr. J. Kerr-Lawson." A letter from the Society for Theatre Research, c/o The Theatre Museum, 1e Tavistock Street, London WC2E 7PA. "The committee of the STR was most interested in the picture and we made various attempts to locate the sitter in reference works on stage performers, such as Wearing's 'London Theatre Record' for the 1890's. Alas we have drawn a blank, and if you find any more information we will be happy to investigate further. Part of the problem is that we are dealing here with a man of mature but unspecified age whose stage career might have been either recent or decades ago. He could have been a juvenile phenomenon, a chorus boy, a circus rider, a romantic lead long before 1920, or he might have played heavy fathers or sung comic songs much more recently. He may have had a stage name, too, or had a career in the provinces in an under-documented location. If you can pick up any further clues from the press coverage of the picture please pass them on. For example, any indication of whether Mr Minney was a 'straight' actor or a music hall artiste would be useful. So far the response to the picture is the only source we have; it is possible that if it aroused a lot of public interest Mr Minney was interviewed, photographed or written up in a chatty way for some non-specialist journal, there used to be much more interest in the Academy than there is now. Have you tried 'Punch', for instance? Or the 'Tatler'? Or the 'London Illustrated News'?" "With a sterling reputation long established among his fellow-painters, Mr Russell's election in 1920 to the associateship of the Royal Academy seemed but a belated official recognition of an artist whose modernity of outlook was concerned always with artistic vitality , whether this was derived from principles that had appealed to him most persuasively in the practise of Whistler and the French Impressionists, or of Constable, or in any other masterly influences through which he had developed his individuality. In the exhibitions of the New English Art Club, of which he has been a member since 1895, his development had long been watched with interest, but only in 1920 did the public that flocks to Burlington House for its summer feast of pictures suddenly become aware of a new painter of individual vision when confronted with the portrait of an elderly, bald-headed man of great bulk emphasised by a white waistcoat; Mr Minney. The name was quickly in everybody's mouth, and always with a chuckle of amusement. I remember at the private view being asked laughingly many times, "Have you seen Mr Minney, by Russell the new Associate?" People began wondering who and what Mr Minney was. Surely, it was thought, he must be "somebody in particular," somebody one ought to know, or at least know about, or he would hardly bulk so prominently in a place of honour in Gallery No.III. Mr Minney was in fact, what in the 'eighties would have been called "the picture of the year". And so the popular fancy, which had eluded the fine artistic accomplishment of a long series of beautiful and interesting pictures by the modest painter, was attracted impishly by this bald man who dominated the Royal Academy of 1920 with his white waistcoated "ventrirotundity" - to borrow Max Beerbohm's word. Yet there was nothing comic about the picture - a brilliant piece of portraiture which now hangs worthily in the Tate Gallery. Nor, when "Max" describes Hokusai's drawing of Ho-Tei, the monstrously fat Japanese god of increase, does he wish us to imagine anything comic about that picture; but, distinguishing between true fatness and mere stoutness, he calls Prince Bismark to witness, that no man can be trusted " in statecraft until he can show a stomach." If this be so, the Mr Minney's career should certainly have been a splendid success. Look, then at Mr Russell's picture and let the painter's psychological insight suggest some clue to the causes of Mr Minney ending his life as an artists model rather than a Cabinet Minister. He had seen life, one has been told; he had trodden the stage, not very much in the limelight perhaps; he had gone through with things - yet, as Mr Russell shows so understandingly and with a fine sympathy, Mr Minney's personal outlook retained a certain dignity which might be called philosophic, or it might be the mere expansive geniality of bulk, the cheery tolerance of the fat man - but perhaps, that flabby hand feebly holding the unfolded umbrella suggests that though he may have gone through with things he never got a grip of them....."
In July 2018 I received an email from Bill Nanny that suggested very strongly that Mr Minney of London was called Charles John Cunningham Minney born around 1850. So with Bill’s and Ancestry UK help this is what I've gathered so far. Lots of gaps from being a young man to him ending up in workhouses from time to time. I like to think that we have finally discovered who Mr Minney of London was. It doesn’t look like he had any descendants and died a few years before the portrait was given to the Tate. See below the initial email from Bill Nanny and results of searches following that. A good friend of mine and a collector of Victorian British campaign medals (as I am) has in his collection a Second China War 1857-1860 medal named to C.J. Minney. The rank on his medal is 'Purveyor' which is a bit of a rarity given it is part of the Commissariat Corps and most likely associated with the Royal Medical or Hospital Corps. Charles John Minney rose fairly high up in the ranks of the Purveyor's Department and retired as Principal Purveyor (the pay of a Colonel). Charles John Minney was the eldest (and perhaps the only) son of John (b 1795) and Sarah (b. 1798) Minney - John was a Clerk in the War Office in London. No doubt his son, 'C. J.' followed somewhat in the footsteps of his father working for the Army and War Office. It must have been a solid position as they lived on Brompton Crescent in Kensington and had a cook and housekeeper. Charles John Minney married twice and through his first marriage had a son - Charles John Cluningham (or Chunningham) Minney . He was born in 1851 in Chelsea. As I mentioned, C.J.C. Minney's occupation is listed as 'Comedian' in the UK Census for 1901 - he was 50 years old. By the time the 1911 Census rolls around he has married (Mary Elizabeth Barrow in 1905) Minney's occupation is now listed as 'Actor'. Living at the time in Lambeth he and his wife have a boarder living with them - an Albert Maurice who is a musical composer (Music Hall variety). I actually found him on a Google search ! When I came across your link and the portrait of 'Mr Minney' who might have been an actor or comedian I thought the period of the painting certainly matches the turn of the century or slightly before (1880s-90s). To be honest I thought researching the surname, Minney might be an easy one but it has proven to be harder than expected. After you dust off those old family files and if you run across any Charles John or Charles John Cluningham Minneys let me know - I'd love to report back there was a music hall performer and his had his portrait painted ! 31/03/1901 for 22 Tunstall Road, Lambeth Charles J Minney, head 78 Married ‘own means’Maria Minney wife 50 and Charles J C Minney son 50 Comedian (crossed out in different handwriting ‘Act’ in its place.) A number of other occupations on the page were also amended. Charles J is born Clapham, wife Maria born Whitley or Whitby (looks like York added afterwards), Charles JC Minney born Chelsea.